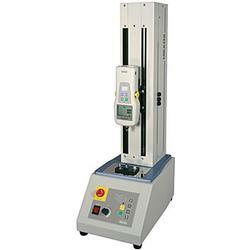 MX-1100 motorized test stands offer advanced force testing. The combination of screw system and state-of-the-art brushless motor provides extremely smooth and powerful operation over the entire speed range. Connect the MX-1100 test stand with an Imada Z Series force gauge and enable force controlled testing and Conditional Overload Prevention. Speed control, quick return and emergency stop are standard features. The MX-500 accepts any of the standard range Imada force gauges. Optional timer and digital distance meter available.